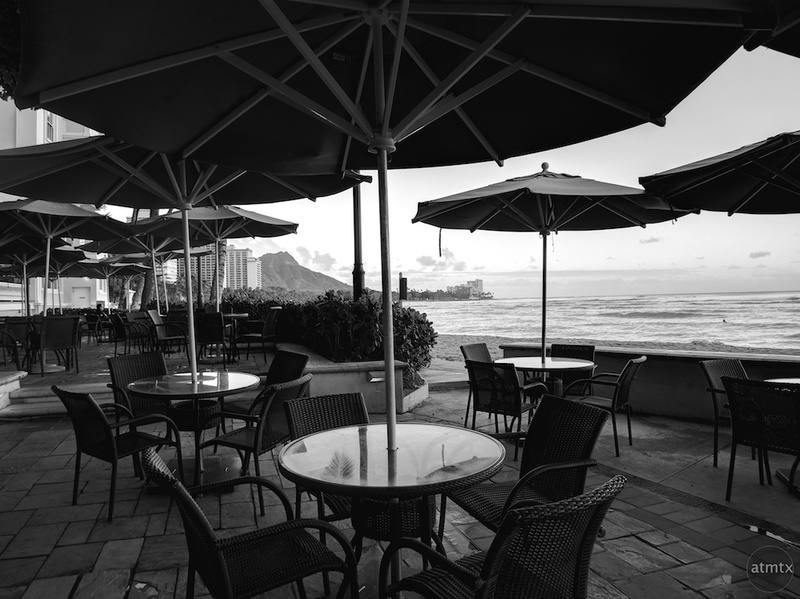 I imagined dramatic golden sunrises breaking over Waikiki beach. 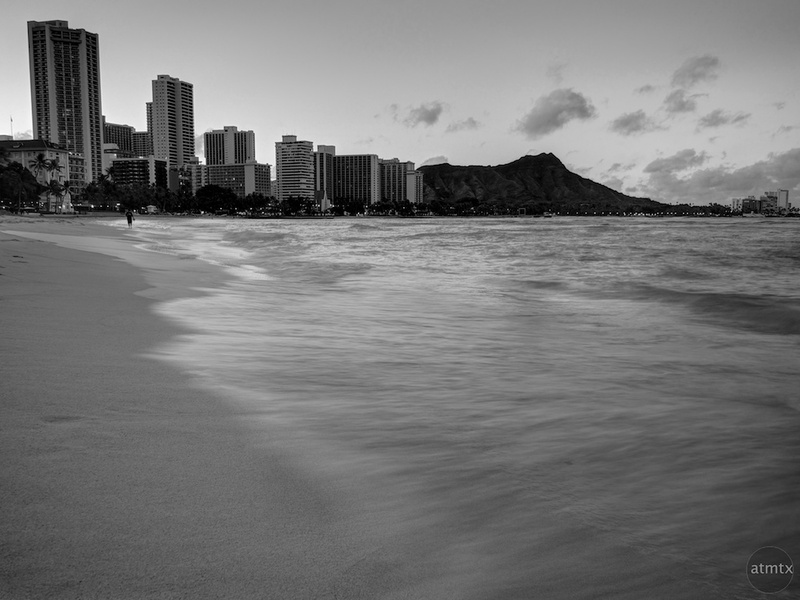 That’s what I wanted to capture when I lugged by tripod and Olympus E-PM2 to Hawaii. It didn’t turn out that way. I woke up early twice before the jet-lag diminished. What I discovered was the sun was hidden behind high-rise hotels and the glorious color was trapped behind these towers of concrete. On these two mornings, there were barely any clouds to add interest. The light was boring and my photos were far from my pre visualized splendor. The bottom line, I didn’t know the best places to shoot and I was at the mercy of weather and light. Using HDR is not going to overcome mediocre light. While the subtle and muted pastels my attract some, I didn’t get the color that I wanted. 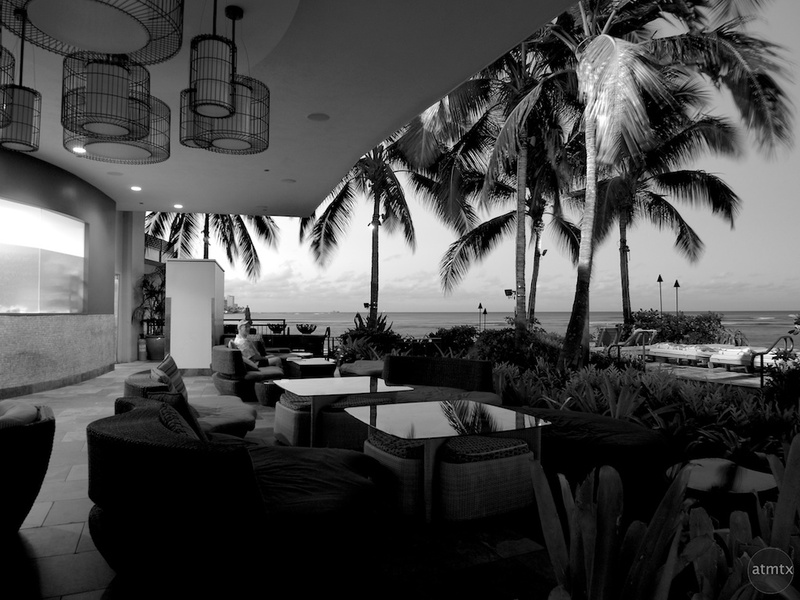 Experimenting with black and white, I realized though atypical, they created dramatic images with contrast. I like these — they are more unusual. But I’ll be lying if I said I planned it this way. In retrospect, I should have gotten here earlier, during blue hour. Or better yet, capturing the blue hour after sunset. Ultimately, if I’m serious about beach landscapes, I need to research and explore. I didn’t have a car so I stuck to places within walking distance. But as you can see, I get bored of just beach and nature. I like having man-made influences. Perhaps I’m more attuned to hard angles instead of the organic forms of nature. 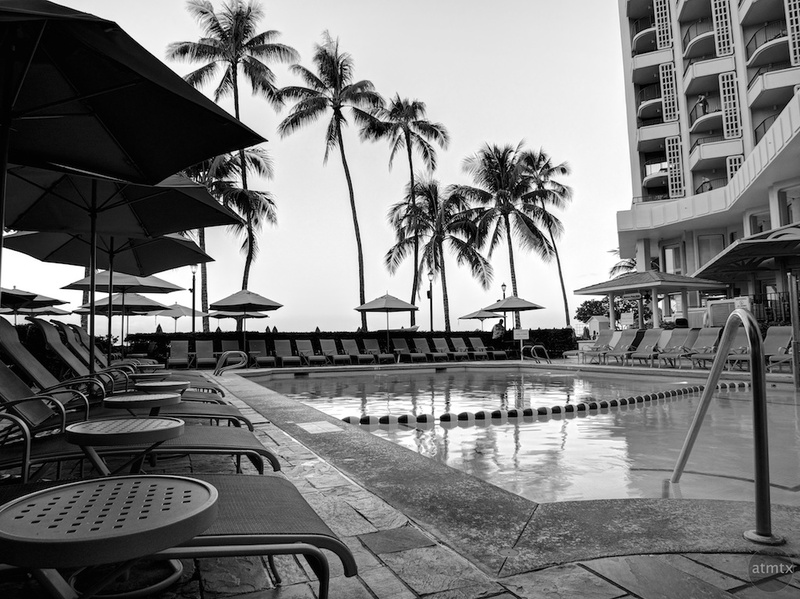 While I’m not a morning person, it was peaceful and more enjoyable shooting around sunrise, at least in Waikiki. This place is so tourist filled that the desolation of early morning works better for landscapes. There’s no clutter of people. The sprinkling of human forms add scale and interest but doesn’t overwhelm. Sometimes, you might even catch an amateur photo shoot by some sisters on the beach. You achieve beautiful clarity with your photography Andy and these monochrome images are no exceptions. 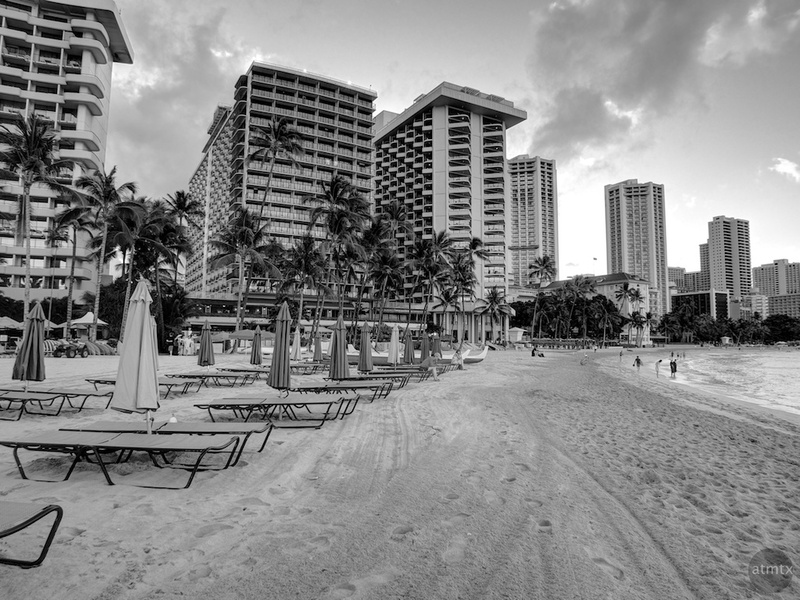 It is unusual as you say, to see a location such as Waikiki captured in black and white but it works in the fashion that you have composed your shots. The lack of colour takes nothing away from the beauty of the place and yet adds a touch of drama as you posited and perhaps some timelessness. Well done. Thank you Cedric. I was generally happy with the composition but not with the color so I guess black and white was a good option. Something I need to keep in mind for the future. Who knew Hawaii was once part of the Soviet Union? I’m glad they preserved one of the Tsar’s winter palaces, as seen in the last photo. Michael, I think the Russian Tsar’s would have like this place and it did exist during Nicholas II’s reign. 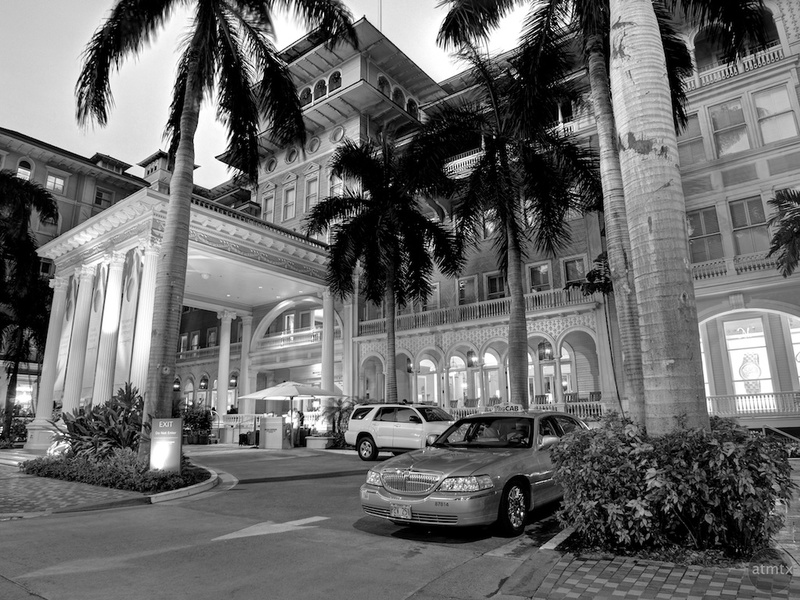 Perhaps staying here would have prevented a tragic end to him and his family. Thank you Marilyn. The benefits of being an amateur, I get to do what I want to make the lemonade.